JRA pothole: Johannesburg Roads Agency (JRA) is continuing to fight its war on potholes and has repaired 44 350 potholes across the city since the beginning of the 2017/2018 financial year. Johannesburg city is faced with an R11.8-billion backlog for upgrading the city’s road network, of which R7.1-billion is required for repairs to surfaced roads and R4.7-billion towards upgrading of gravel roads to tar. “Based on the 2017 JRA roads conditions study, we are faced with a 25% increase in the deterioration of the road network condition, from 89% to 64%. 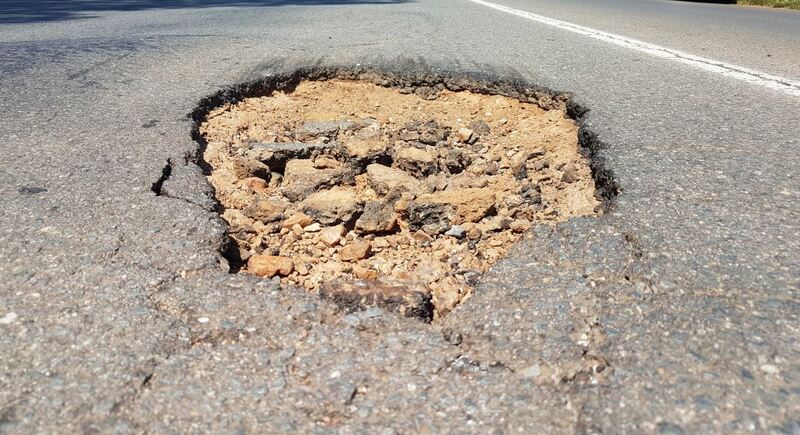 The excessive damage to our road network has resulted in a rise in pothole reports and increased safety concerns,” says Transport MMC, Nonhlanhla Makhuba. The good news is that the Johannesburg Roads Agency (JRA) is continuing to fight its war on potholes and has repaired 44 350 potholes across the city since the beginning of the 2017/2018 financial year. Potholes are surface failures which extend into the base layer of the road forming a hole. Over prolonged periods, in wet conditions potholes generally develop into major structural failures creating increased risks to road users. JRA has continued to prioritise pothole repairs with R88-million allocated towards fast tracking repairs and priority roads scheduled for upgrades. Since July 2017, a total of 520 km of roads have been resurfaced, 32.26km upgraded from gravel roads to surfaced roads and a total of 0.3km of open storm-water drains have been converted to underground systems. To improve turnaround time by working with communities to increase uptake of JRA’s Find & Fix app to log road service related requests. Proactive citizenry will enable swift service delivery. In an effort to enhance service delivery, JRA is in the process of completing the installation of its R53-million asphalt plant. The new plant will improve efficiency, production of hot and cold tar mix through improved environmentally friendly processes. The plant will increase capacity to JRA’s Road Surfacing Depot and seven regional depots with the supply of asphalt for pothole repairs and road surfacing. As part of its R1 213-million JRA 2017/2018 budget, R240-million has been allocated towards resurfacing and reconstruction. The allocation is split with R140-million for resurfacing and R100-million for reconstruction. A further R295-million has been allocated towards the upgrading of gravel roads. In terms of the state of the roads, at present, 32% of surfaced roads which make up 3 968km requires reconstruction; 45% of surfaced roads which make up 5 581km are in very good and good condition and may require ad hoc maintenance; 23% of surfaced roads which make up 2 852km require resurfacing; and of the 1168.53km of gravel roads, 72% require reshaping and re-gravelling.